We powered up the system using the large front power button, which instantly lit up with a pleasing white LED glow around the edges. The transparent plastic slabs in the front air intakes also glowed with a dim white light. This was barely perceptible in a well-lit office, but is quite attractive in a darkened room. Another good thing that was barely perceptible was noise. 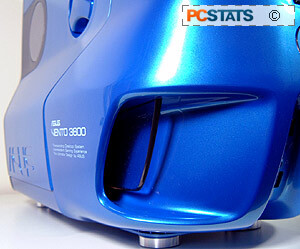 With a AOpen power supply and an MSI Nvidia 6600 GT-based card installed, the Vento 3600 was very quiet, and the two installed fans made no noticeable noise. Your results will change depending on the CPU cooler you are using, of course, but the Vento's construction has a definite muffling effect and we doubt you'll hear much noise with a stock cooler. All in all, the Asus Vento 3600 was a pleasure to look at, and pretty good on the ease of installation front. On the other hand, the front access panel continually annoyed us with its unwanted springiness and that left side panel was always a little trickier to get back on than we really cared for. 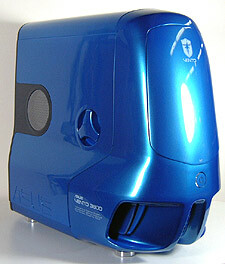 Our feelings for the ASUS Vento 3600 case can be summed up as a mixture of awe, disappointment and admiration. On the one hand, the case looks awesome with eye-catching styling and the best paint job we've yet seen on a stock case. On the other hand, some questionable design decisions mar the initial impact of the case. In particular, the decision by ASUS to stencil what amounts to ad-copy on either side of the case in unavoidable, unremovable white letters struck us as being in poor taste, and we desperately wished for a more dignified opening system for the front access panel. The second that the panel is release and it springs up and smacks against the roof of the case, a lot of the 'atmosphere' the Vento 3600 seems to be striving for is lost. Other design decisions left a much better impression though. We loved the swivelling handle that opens the left hand panel. It looks and works great. The air vent on the same panel which provides fresh air directly to the CPU cooler is another excellent idea. Likewise, the roominess of the case and the rounded edges met with our approval. The screwless drive securing mechanism worked as it should, though the removable hard drive tray was clunky. We liked the addition of rubber vibration dampers to this tray to help decrease latent noise. In use, the ASUS Vento 3600 worked well. The included fans are almost silent and the mass of metal and plastic that makes up the case has a definite damping effect on other sounds from your PC. At a price of about CAN $165 ($135USD) without a power supply, the Vento 3600 is certainly priced at the high-end, but on the other hand it never failed to attract comments from everyone who walked past... If you took a look at the pictures and you know you want it, you have our blessing. If not, there are certainly cheaper, plainer cases with the same range of internal features as the Vento 3600. Beauty is in the eye of the beholder.